Plastics Heritage: History, Limits and Possibilities (congress general theme), is the fifth in a series of international Plastics Heritage Conferences and will be held in Lisbon (29 – 31 May 2019), the capital city of Portugal at Museu da Farmácia. All proposals must be in English. For advice on preparing your submission and the conference presentation, please consult the guidelines. The final deadline for session proposals is 30th August 2018 and for individual paper proposals is 15th November 2018. Proposals should be sent electronically (as a pdf or Word file, Times New Roman, 11, single space) to Guenter Lattermann (guenter.lattermann@uni-bayreuth.de), the chair of the programme committee or Maria Elvira Callapez (mariaelviracallapez@gmail.com), co-chair. INDIVIDUAL PAPER proposals must include: (1) a 200-350-word abstract; and (2) a one-page CV. Abstracts should include the author’s name and email address, affiliation, a short descriptive title, a concise statement of the thesis, a brief discussion of the sources, and a summary of the major conclusions. If there are more than one author, please underline the speaker(s). If you are submitting a paper proposal dealing with a particular subtheme, please indicate this in your proposal. SESSION proposals must include (1) an abstract of the session (200-350 words at maximum), listing the proposed papers and a session chairperson; (2) abstracts for each paper (200-350 words); (3) a one-page CV for each contributor and chairperson. Sessions should consist of at least one set of presentations – but no more than four time slots of 90 minutes – and they may include three or four papers in each, which might extend series of successive sections over more than one day. Proposing a commentator – instead of the fourth presenter – is also possible. The programme committee reserves the right to relocate papers to different themes and add papers to sessions. We also encourage proposing roundtables and other “untraditional” as well as experimental session formats. Whatever the session format will be, organisers and chairs are expected to reserve enough time for general discussion between the presenters and audience. 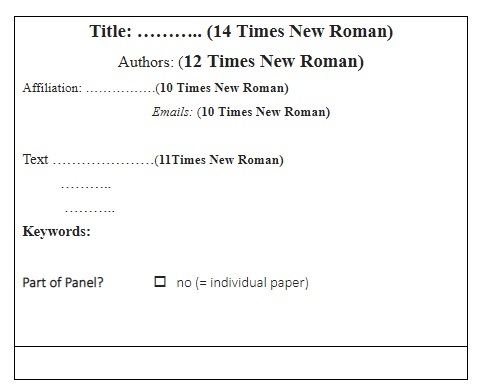 POSTER proposals must include (1) a 200-350-word abstract; and (2) a one-page CV. Abstracts should include the author’s name and email address, a short descriptive title, a concise statement of the thesis, a brief discussion of the sources, and a summary of the major conclusions. Please, indicate one of the specified subthemes for your poster. We like to invite you to present your poster in a “Flash Talk session”. That means that the presenter may deliver a short oral talk in the auditorium (3 PowerPoint slides in 2 minutes). The posters will be exhibited in the venue hall during the whole congress. The presenters will stay with their posters talking with people about their research during the coffee breaks and at a poster session. Full fee will cover documentation, coffee breaks, lunches, welcome reception, tour to Leiria, certificate, and book of abstracts. Please make sure you register and pay the fee until April 30 in order to secure your inclusion both in the scientific programme and in the Book of Abstracts. Concessionary fee is open to students, retired people and independent scholars. You may be required to provide proof of status. The accompanying person is entitled to join at any events of the congress (sessions, welcome reception, tour). Payments will be made according to the instructions to be found in the coming registration form.